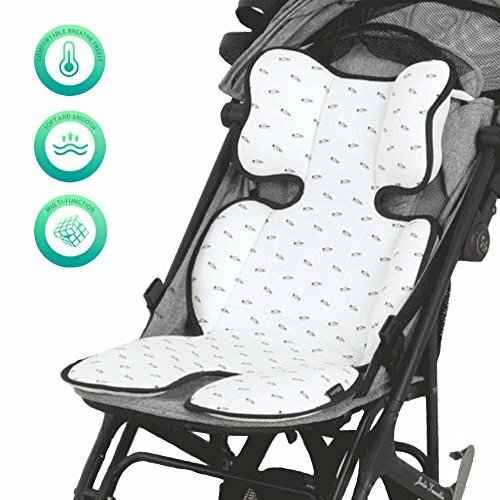 Furrybaby 3D Air Mesh Car Seat uses genuine hand-made 3D-mesh technology to keep baby cool in warm weather in car seat or stroller. It is constructed with a series of pillars between the top and bottom layer creating a space inside the material where air can circulate easily, providing a cooling effect in warm weather. More breathable and has greater air-flow than bamboo, ramie or air-mesh. No more sweaty back again, let your loving little one enjoy a comfortable and cool summer! High quality silky feel tencel fabric, breathable, soft, and cool to the touch. Easy care, machine washable in warm water and gentle cycle. Lightweight and can be folded or rolled makes it easy to carry around. High density weaving workmanship, smooth and durable. Two elastic hooks on the top help to keep the stroller liner in place. Universal Design. Compatible with most car seats,strollers,high chair and more. Provides ideal support for babies seated in car seats, strollers, and infant swings. 3D mesh design provides soft feeling and strong air permeability. 0.4-0.8 inches measuring error allowed. Adult supervision is requid when using the product. Any problem will be given a fine solution. Any suggestions or idea would be respected and welcomed. SIZE: 28.7 × 15.7 inches. Made of 100% polyester, Breathable 3D mesh technology accelerates heat dissipation, keeps baby from sweating in hot summer. Also helps keep baby comfortable in cold weather. The color and pattern look stylish and are gender neutral, suit both girls and boys alike, no matter your style. This stroller liner is suitable for most strollers, high chairs and car seats. Two elastic hooks on the top make it simple to install seat/stroller straps, keeps the liner from shifting. Machine washable in warm water and gentle cycle, air dry in the shade and return. Also free storage by fold or roll. If you have any questions about this product by furrybaby, contact us by completing and submitting the form below. If you are looking for a specif part number, please include it with your message.